Reflexology is a science that deals with the principle that there are reflex areas in the feet and hands which correspond to all of the glands, organs, and parts of the body. Reflexology is a unique method of using the thumb and fingers on these reflex areas. 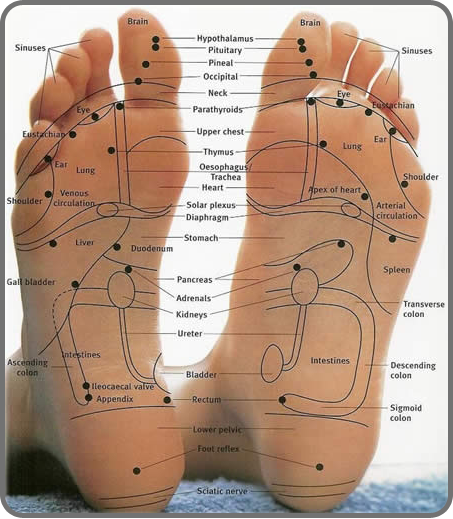 The use of foot and hand reflexology includes, but is not limited to, relieves stress and tension; improve blood supply and promote unblocking of nerve impulses; help achieve natural homeostasis, in other words, this is a wonderful treatment that aids every organ and glands ability to function, release poisons, and EASE PAIN. Many have an increased sense of well- being after a reflexology session.